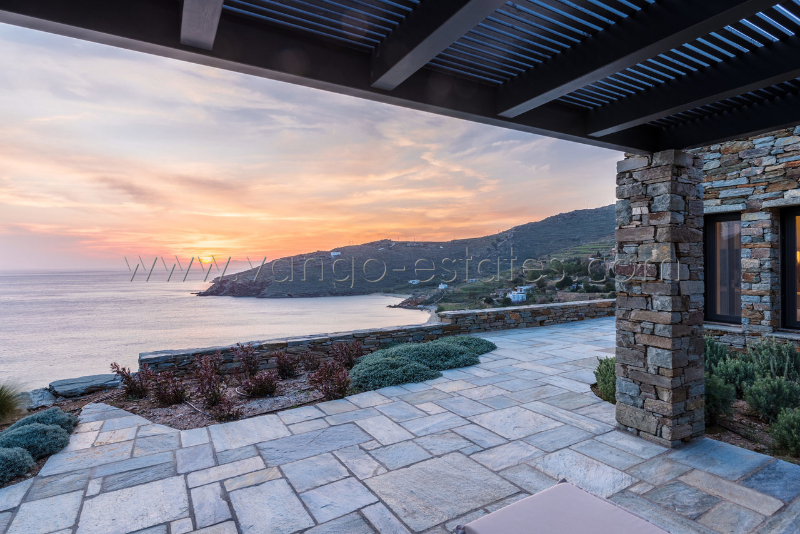 A spacious 180m2, three bedroom villa, built in accordance with the traditional stone architecture characteristic of Tinos, so that it blends perfectly with the landscape, while discreetly offering a completely modern and appealing interior. It is built exactly 100 meters from the sea, which is the legal limit in Greece, in the middle of a four hectare (4.000m2) plot of land, which stretches down to 50 meters from the beach. The northern part of the land has been left in its natural state, with lots of thyme, oregano and sage bushes that are natıve to the Greek landscape, while the southern half has been planted wıth olive, lemon, pomegranate and other indigenous trees and plants. To swim, you use a beautiful, centuries-old 50 meter-long, gently sloping stone path to reach the sea. The beach is divided into two coves, alternately with sand and pebbles, a small Church in the middle and, in the shallows, the remains of a German Navy ship sunk by British warplanes during WWII. Every bedroom has a separate bathroom and its own veranda, with 2 lounge chairs, air-conditioning and a ceiling-fan, which can be used instead of the air-conditioning to give a more natural freshness. Due to the climate of the island, however, neither the fan nor the air-conditioning is often necessary, because the temperature at night is naturally cooler. The house consists of an entry level, with one large bedroom and bathroom, a large laundry and storage area. This is connected by an inner and outer staircase to the upper level, which contains the living room, a large open kitchen/dining room, the master bedroom and a guest bedroom. There is a traditional stone dining table on the main veranda, which is protected from sun and wind, as well as an interior dining table, affording an easy choice. The house comes with a satellite TV connection, with Greek and foreign channels (English, French, German, Arabic and others) and four 24-hour movie channels (movies primarily in English). There is a permanent WIFI internet connection. The kitchen is fully equipped and easy to use, and you can enjoy the sea–view directly while using it. In the laundry room there is a washing machine and a dryer, hot water is provided automatically, sheets are changed every three days and daily cleaning is provided every morning. There is a three-car, covered garage and further parking space for several more vehicles, if necessary. There is a small number of neighboring houses which are situated a fair distance away, so that the house affords a good deal of privacy, without being completely isolated. Its position, roughly 20 minutes by car from the main port of the island, ensures easy accessibility, but also a natural environment well-suited for relaxation and calm according to choice. The villa faces west, allowing one to admire the sunset directly from any part of the house, inside or outside. There is an unimpeded sea view from every room and, due to its proximity, the presence of the sea is felt at all times, providing a truly unique experience of nature, sea and sky.